Dinesh Agarwal, Founder and CEO, IndiaMART.com, says, “Recently more than 4,000 of our employees, located across 75 officers across the country, started using Google Apps, as their primary messaging and collaboration suite. The cloud offers improved infrastructure and management than what is ordinarily possible with on-premise solutions, “he says. As reports indicate, SMBs (small and medium business) have taken to the public cloud in a big way. While large enterprises continue to watch this space and evaluate their options. For larger enterprises, the path to the cloud is not clear with regard to the model the works best for them-public, private or hybrid. Before we look at actual study details, let us look at the direction that the cloud is taking in 2011. Public cloud, also referred to as ‘external’ cloud incorporates the conventional meaning of cloud computing scalable, dynamically provisioned, often virtualize resources available over the internet from an offsite third-party provider, which divides up resources and bills its customers on a ‘utility’ basis. Despite being a hit with the SMEs, report say that many enterprises feel public clouds are too restrictive with rigd infrastructures, incapable of being customized to meet their particular needs. And this brings private cloud technologies to the center stage which, they feel, should be the preferred option. Daya Prakash, Head IT, LG Electronics India Ltd, agrees. He says that as a company policy, they have decided not to go for the public cloud model and have hosted some mission-critical applications such as supplier portal, service portland sell out management system on the private cloud. 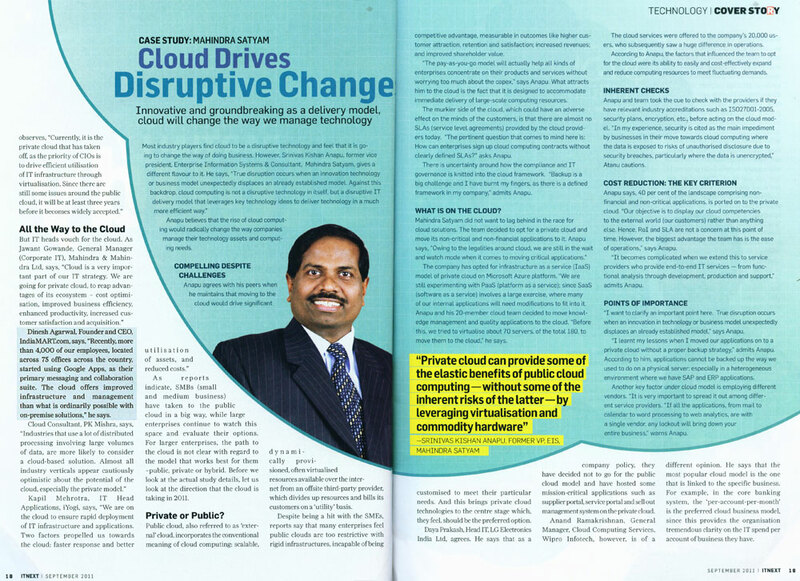 Anand Ramakrishna, General Manager, Cloud Computing Services, wipro Infotech, however is of a different option. He says that the most popular cloud model is the one that is linked, in the core banking system, the ‘pre-account-per-month’ is the preferred cloud business model, since this provides the organization tremendous clarity on the IT spend per account of business they have.